August Wilson’s play Jitney, which opened recently in a very fine revival at Orange County’s South Coast Repertory, is an odd man out in many ways. One of the first plays written by Wilson, Jitney was reworked and then reworked again for premieres in both 1996 and 2000 following a production in its original version in 1982. It’s one of the 10 plays that make up Wilson’s “Pittsburgh Cycle” which examine the African American experience throughout the 20th century decade by decade, nearly all of which are set in Pittsburgh’s Hill District. Jitney, an episodic story of the men who work in an unlicensed taxi business, or jitney during the early 1970s, is set in that same neighborhood, although it predates the idea of the cycle itself. 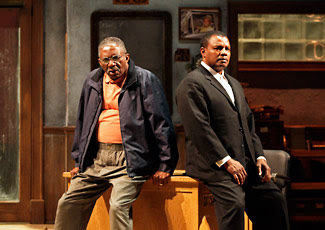 Later after the successes of Wilson's Fences and Joe Turner’s Come and Gone, the scope of the overall project came into focus and the connections between the plays began to take shape. But Jitney stands alone. While there is still the sweep of socioeconomic, historical and cultural issues that fill the plot, the play's structure is looser and less focused. The magical realism that repeatedly comes up in the later plays has yet to surface with Jitney feeling a bit more like Arthur Miller than Gabriel Garcia Marquez. Powerful emotional scenes tend to run on, uncertain of exactly where to stop and a crush of subplots sometimes leave the greater arc of the show wanting. And yet the play is unmistakably Wilson’s with its ambition and its real-life integration of multiple conflicting cultural contexts. The South Coast Repertory and director Ron OJ Parson have concocted such a loving, detailed version of the play in this revival that the show succeeds despite the source material's limitations. There's beautiful language here and powerful emotion that shines through within the lives of these men. The ostensible central figure is Becker, the owner of the jitney business, played by the always excellent Charlie Robinson. Robinson has given masterful performances in many of Wilson's plays in the area theaters including superb turns as Troy in Fences at both SCR and The Odyssey Theater in recent seasons. Becker's son Booster, a convincing Montae Russell, is just out of prison for a murder charge, and all the drivers are already aware that the pending reunion is not going to go well. Those drivers have a variety of their own issues. Youngblood, played by the very watchable Larry Bates, is an eager young man with dreams and plans to achieve them that his common sense can't always quite cover. Many of the others have a variety of issues that promise to threaten not only their own functioning but the operation of the business, including the alcoholic Fielding, an eloquent David McKnight, and an armed busybody and shop gossip Turnbo, played by Ellis E. Williams in another superb addition to the cast. Sometimes the set and surroundings for these characters looks a bit too polished and tidy to feel completely real, but the ensemble manages to transcend any off message visual cues with performances that feel lived-in and emotionally authentic. Parson and SCR have produced a vision of Jitney that far from standing apart from Wilson's history plays, feels fully integrated. History and the world seem to flow from these crises and conflicts for a wonderful evening overall. Jitney continues through June 10 in Costa Mesa, and with the holidy weekend, you've got plenty of chances to see it.